When former Congressman Mark Stedman throws in the towel on his presidential campaign, his only choice is to return to his home state and decide how to spend the rest of his life … until he meets Josiah Stoltzfus, an Amish farmer from Pennsylvania. Stedman learns more from Josiah in a few hours than in his many years in office. He comes to the conclusion that someone like Josiah should be running the country. Not a career politician, but someone with a little old-fashioned common sense, someone who’s not afraid of rolling up his sleeves and getting his hands dirty. Someone like Josiah Stoltzfus. Using his old campaign headquarters for a base, Mark Stedman determines to introduce a new candidate to America. He pledges to do everything in his power to make sure Josiah gets elected. But can a plain man of faith turn the tide of politics and become the leader of America, and what will he have to risk to do it? Really I was quite afraid of this book. I just wanted to read a good book without the stress of hearing any more about politics. The book name and cover though drew me in. 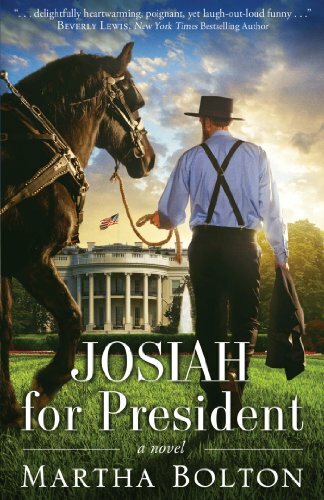 Then you throw in the idea of an Amish man entering politics and I had to read it. I loved Josiah with his homespun wisdom and patience. He was a hard worker and also a family man. I could have read even more about his life in the Amish community and would have been happy. I also loved reading about the politician, Nick. How he just couldn't give up the his ideas and hopes for the future. He was a good person and had good values. There did come a point where I thought I knew exactly what was going to happen. You know when you think, why don't they just wrap this up now? Well, I kept reading and was surprised to find a total different ending that what I expected. I found this at the church library and thought it would be a great book to read at this time.